Woodpeckers do a better job than most at tongue-sticking-out. Because of the venues many woodpeckers count on for food (trees, ant burrows, logs) they need to reach deep inside for a snack — and so some species have evolved extraordinarily long tongues. 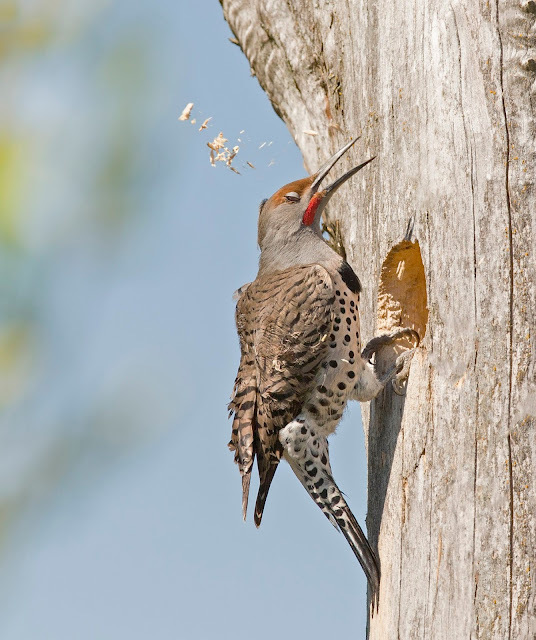 Northern Flicker (male) busily building a nest at the wetlands. According to the Peterson guide to woodpeckers, cited below, Herbert Job, an early 20th century naturalist and bird photographer, placed woodpeckers in the Order of the Knights of the Chisel for the way they bore into wood and extract their prey. 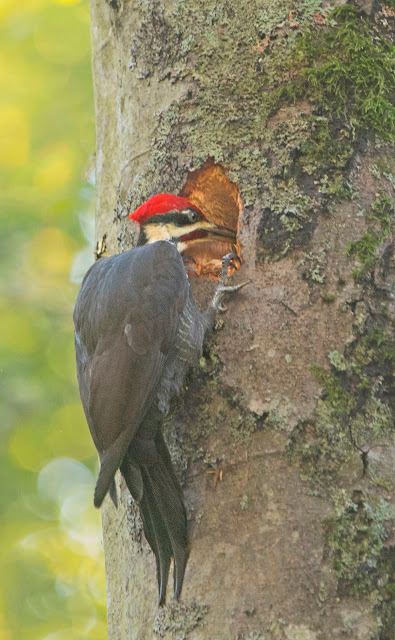 The Audubon Society says that there are six species of woodpeckers found in the Portland-Vancouver metro region: Downy Woodpecker, Hairy Woodpecker, Pileated Woodpecker, Acorn Woodpecker, Northern Flicker, and Red-breasted Sapsucker. Gloria has seen and photographed five of the six, all included here. Seems the Acorn Woodpecker eludes us still:) The one we see by far the most often is the Northern Flicker, who, as it happens, reportedly has the most extendible tongue of North American woodpeckers: two inches beyond the tip of its bill. They need the long tongues because the flickers eat mainly insects, especially ants and beetles that they gather from the ground. 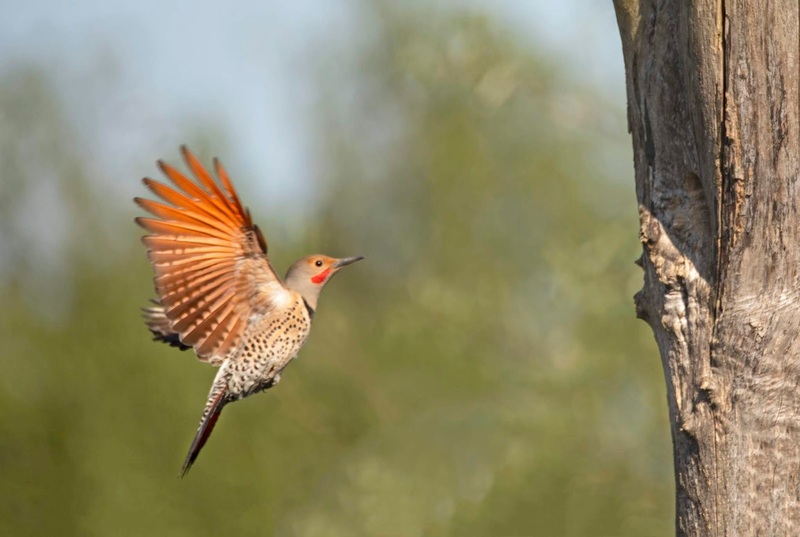 Flickers often go after ants in underground burrows, hence the advantage in having the long reach. Leonardo da Vinci was intrigued with the woodpecker’s tongue, and for good reason: in order to extend so far, it has to coil around inside the woodpecker’s head, with its supporting structure ( a combination of bone and muscle) extending to the top of the skull. The long tongue, when curled within the bird’s skull, even helps to cushion the woodpecker’s brain against the enormous impacts of hammering on wood; part of the skull is spongy to help absorb shock as well. 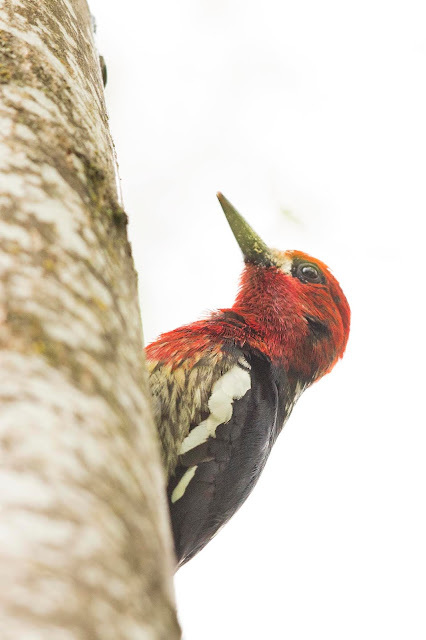 And that ain’t all: the woodpecker’s eyes and ears have unique shock-tolerant adaptations. The eyes have super-thick lids to prevent the eyes from popping out, and the third eyelid (the nictating membrane) closes just before the beak hits, to keep debris out of the eye. The ear bones are strengthened by two additional plates, and the eardrum is thicker to withstand the noise of hammering. 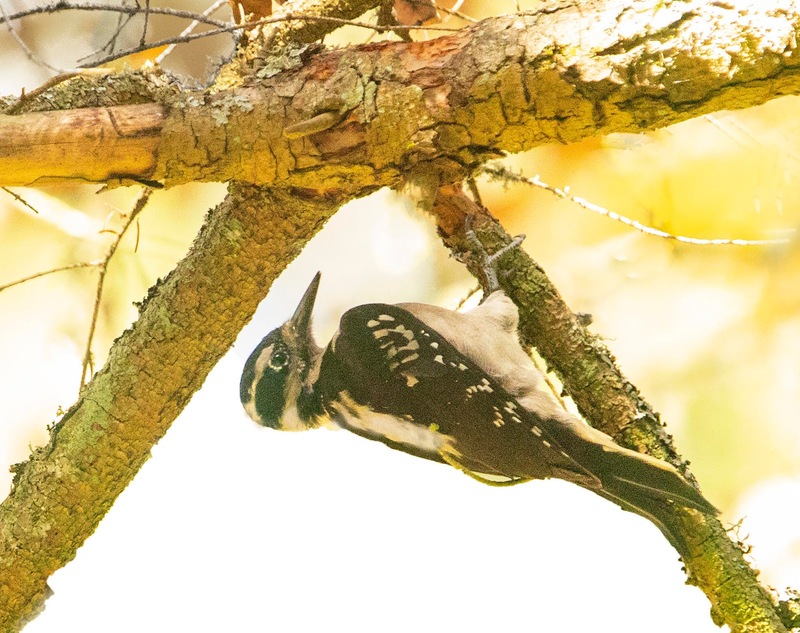 Even the woodpecker’s tail is adapted for burrowing: the tail bones are fused and the feathers more rigid than in most birds so the woodpecker, so often poised vertically on the tree, can brace itself with its tail while hammering. 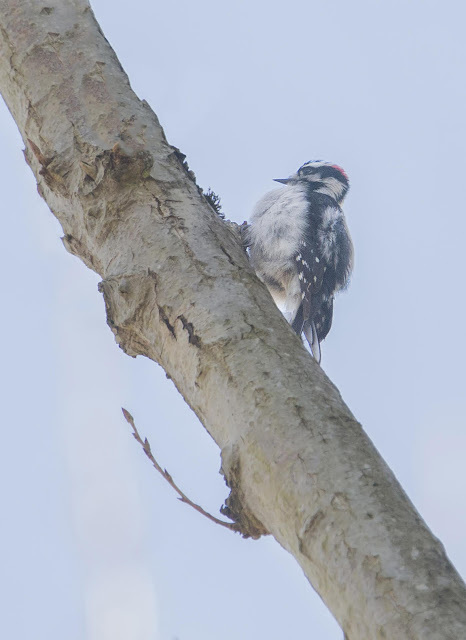 Not all woodpeckers have all of these features, but the ones who burrow deep into hard wood are amazingly specialized. 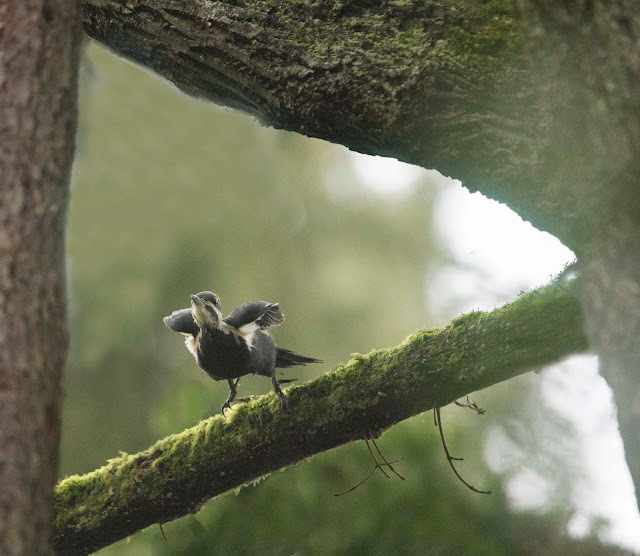 Next time you hear a knock-knock-knocking amidst the trees, look up; you may just spot one of our six species. And if you see the Acorn Woodpecker, let us know! Hairy Woodpecker, checking life out from a different angle!